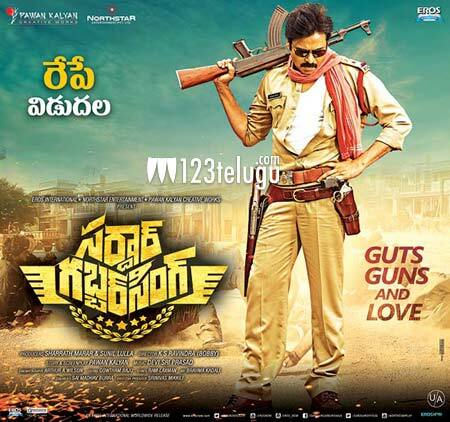 Pawan Kalyan’s latest film Sardaar Gabbar Singh is set to take overseas markets by storm. The film, produced by Sharrath Marar and Sunil Lulla, has been directed by KS Ravindra (Bobby), and Pawan Kalyan himself has written the story and screenplay. Kajal Aggarwal is the lead actress and Sharad Kelkar will be seen as the main villain of the film. In USA alone, the film is going to be screened in as many as 184 locations, which is one of the highest ever for a Telugu film and on April 7, more than 300 premiere shows have been scheduled throughout the US. Several shows are being added at the last minute to cater to the huge demand for the film. On the whole, the film is expected to release in close to 350 screens around the world (excluding India), which will include USA (184 screens), UAE (46), Australia and New Xealand (22), Canada (17), UK (15), Germany (13) Malaysia (1), Mexico (1), South Africa (1), Qatar (1), Kuwait (7), Bahrain (3), Oman (7). iDream Media and Eros International, which are releasing the film in overseas territories, kickstarted an extensive promotional campaign, along with Northstar Entertainment, for Sardaar Gabbar Singh. On the day of the audio launch, a flash mob was held in Munich, Germany and several such flash mobs were organised in other locations including USA, South Africa and Gulf region. Apart from this, several t-shirts and red scarves, which became a signature style of Pawan Kalyan in the film, were distributed in few areas in the US and both of them have become a rage with Pawan Kalyan’s fans. In UAE, a tattoo campaign was launched which drew a large number of Pawan Kalyan’s fans, who got the titled ‘Sardaar Gabbar Singh’ tattooed on their body. While these were just some of the measures taken to promote the film, an extensive digital campaign was also launched to create buzz surrounding the film in the past few weeks. All in all, with everyone awaiting Sardaar Gabbar Singh’s release with bated breathe, it’s already become the talk of the town and considering the buzz surrounding the film, it’s poised to take a phenomenal opening at the box-office in overseas markets.